MIT researchers seeking for ways to avoid the complications associated with CRISPR/Cas9 delivery via viral vectors, have developed a new lipid nanoparticle that features a chemically modified single guide RNA (sgRNA), which may protect it against nuclease degradation, and thereby boost efficiency of the overall CRISPR/Cas9 gene-editing system. According to the MIT team, which was led by Daniel G. Anderson, Ph.D., an associate professor of chemical engineering and a member of MIT’s Koch Institute, the new delivery technique cut out certain genes in about 80% of liver cells, the best success rate ever achieved with CRISPR in adult animals. Details about the new delivery system appeared November 13 in the journal Nature Biotechnology, in an article entitled “Structure-Guided Chemical Modification of Guide RNA Enables Potent Non-Viral In Vivo Genome Editing.” According to this article, the new delivery system could sidestep some of the complications encountered with delivery via viral vectors. For example, once a particular virus is used, the patient may develop antibodies to it, so that it cannot be used again. Also, some patients have pre-existing antibodies to the viruses being tested as CRISPR/Cas9 delivery vehicles. The researchers analyzed the structure of the complex formed by Cas9 and the sgRNA to figure out which sections of the sgRNA strand could be chemically modified without interfering with the binding of the two molecules. Based on this analysis, they created and tested many possible combinations of modifications. The current study builds on previous work by Anderson, Yin, and their colleagues. Back in 2014, the team developed a nonviral delivery system in the first-ever demonstration of curing a disease (the liver disorder tyrosinemia) with CRISPR in an adult animal. However, this type of delivery requires a high-pressure injection, a method that can also cause some damage to the liver. 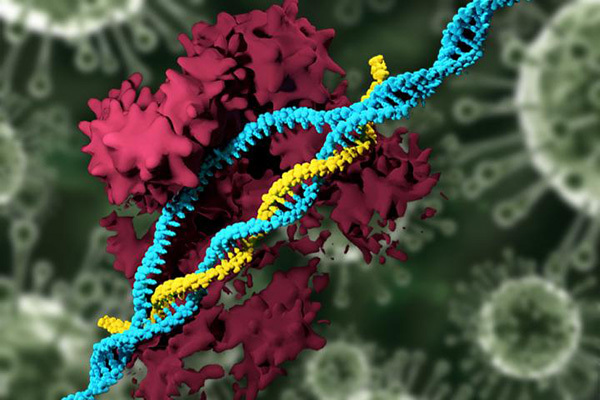 Later, the researchers showed they could deliver the components without the high-pressure injection by packaging messenger RNA (mRNA) encoding Cas9 into a nanoparticle instead of a virus. In a previous study in which the team delivered gRNA via a virus, the researchers succeeded in editing the target gene in about 6% of hepatocytes, which is enough to treat tyrosinemia. In the current study, the researchers experimented with knocking out a few different genes expressed by hepatocytes, but focused most of their attention on the cholesterol-regulating Pcsk9 gene. This gene was eliminated in more than 80% of liver cells, and the Pcsk9 protein was undetectable. In the treated mice, a 35% drop in the total cholesterol level was found. The researchers are now working on identifying other liver diseases that might benefit from this approach, and advancing these approaches toward use in patients.